When hotels in Green Bay and Milwaukee cancelled Worldview Weekend events – which included Understanding the Threat’s President John Guandolo – the entire war for liberty and the soul of our Republic was on full display in America’s heartland. The Southern Poverty Law Center (SPLC), a corrupt Marxist organization working daily with Hamas in the United States doing business as the Council on American Islamic Relations (CAIR), sent the message out. 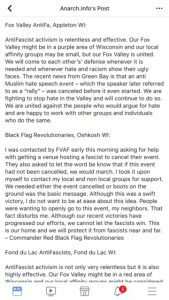 That message was dutifully received by the SPLC’s terrorists at Antifa who then launched a campaign to intimidate and threaten venues hosting Worldview Weekend’s events. Worldview Weekend (WVW) sponsored a 5 city/5 day speaking tour on national security matters in Des Moines (IA), La Crosse (WI), Green Bay (WI), Bloomington (MN), and Milwaukee (WI). According to Worldview Weekend’s founder Brannon Howse, there were over 1000 people registered in Milwaukee and over 1500 registered in Minnesota. Worldview Weekend hosts UTT’s TV and radio programs at WVWTV.com and WorldviewRadio.com, respectively. Understanding the Threat published a video on our YouTube channel detailing key events of the tour’s cancellation. That video can be seen HERE. Worldview Weekend’s Brannon Howse published a video interview with Chris Gaubatz about the events and the tour cancellation which can be seen HERE. 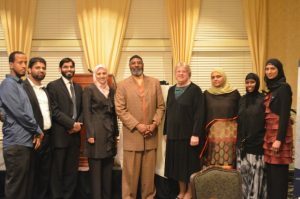 Several Marxists and a few sharia-adherent muslims attended the event in Des Moines, including Iowa State Representative Ako Abdul-Samad, a sharia-adherent muslim (jihadi) and the Chairman of the jihadi organization American Muslim Alliance, and Abshir Omar, a candidate for Des Moines City Council who previously served as the Director for Hamas in Iowa doing business as the Council on American Islamic Relations (CAIR). 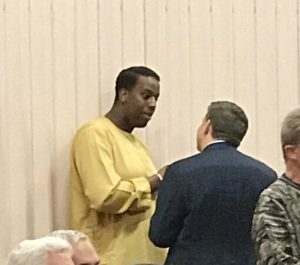 WHO TV, Des Moines Channel 13 news was present at the event and interviewed Brannon Howse, UTT’s John Guandolo, and Representative Abdul-Samad. Oddly, the news station posted the raw interview of Abdul-Samad on their website but not the raw interviews of Brannon Howse or John Guandolo. 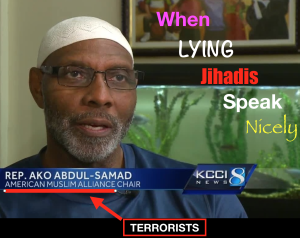 Abdul-Samad was previously praised by Hamas (CAIR). The WHO TV piece on the event as well as the raw interview of Abdul-Samad can be seen HERE. 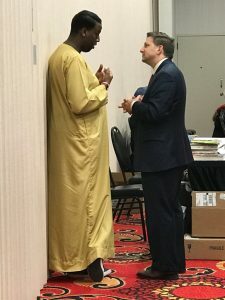 After John Guandolo spoke, Abshir Omar approached him and the two men had a lengthy discussion which Omar describes as “cordial.” In the discussion, Mr. Guandolo was able to get Abshir Omar to admit that all of Islam requires apostates (those who leave Islam) and homosexuals to be killed. 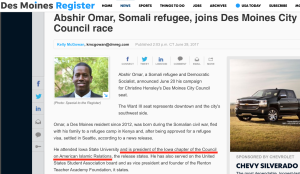 Omar is a Somali muslim refugee and a member of the Democratic Socialists of America who was supported by CAIR in his unsuccessful 2016 bid for Des Moines City Council. Today, UTT published a new video with John Guandolo rebutting untrue/defamatory comments by Iowa Representative Abdul-Samad, and discussing the command in Islam for muslims to lie to non-muslims and speak pleasantly and in a “refined manner” to them while doing it. Share this story with as many people as you can. Share this story with Laura Ingraham @IngrahamAngle because she publicly asked for examples of free speech being silenced in the United States, and this is a GREAT example. Support Brannon Howse at Worldview Weekend in whatever way you are able. Brannon has demonstrated courage and tenacity in this battle for the truth. www.WorldviewWeekend.com. Support Understanding the Threat (UTT) by: (1) sharing our work with others; (2) subscribing to our newsletter; (3) purchasing our resources (books/DVDs) or using our free resources HERE; (4) watching our TV show at WVWTV.com; (5) listening to our radio program each week at WorldviewRadio.com (John Guandolo); (6) subscribing to our YouTube channel; and (7) Supporting UTT financially and consider participating in our 25 for Freedom Campaign and commit to $25 per month to UTT. Click HERE to donate. Join us as we take the fight to the enemy and put FREEDOM back on the offensive where it belongs. I clicked on the link, for WHO channel 13 News, interview with Ako Abdul Samad reacting to the seminar and of course being very pleasant, talking about why other hotels would cancel, as if he was unaware, so politely calculating, very deceptive. and not mentioning that you were quoting from authentic sources, the Quran, Sharia law and Haddiths,) he did his obligatory smooth refuting of the truth.Shortly after the his interview, the channel used a story about the Des Moines Iowa Museum of funeral caskets history, I found that to be very disturbing. I wonder who influenced that decision at the T.V.station, as if it was a veiled threat to attend such events.. 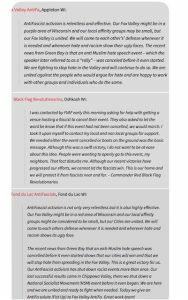 The event looked successful and I wish WI would have backed your event, as I have written to you before it has spread in my town and it is frightening to experience the changes. Your video is excellent and so true. God Bless you. Waiting for the day the media “get’s it” and the seriousness of the dangerous influence unchecked. Inasmuch as the United States is perforce engaged in an existential war* with Islam, with whom Marxists constitute an alacritous ally, any adult member of either organization who refuses to answer a direct question by competent authority as to their willingness to declare their loyalty to the United States and to renounce any allegiance to any foreign government and/or the draconian philosophy referred to as “sharia adherence” should either be incarcerated in the United States in accordance with Senate Resolution 166, of July 6, 1943, as appropriately amended, or deported to the geographic location to which said contextually criminal allegiance is owed. Furthermore, any member of a Federal. State or local law-enforcement entity who engages individually or collusively in an interstate attempt under-color-of-law to effectively prevent UTT, or anyone else, from engaging in their Constitutional right of free speech regardless of context, and/or who it offends, they should be cited for sedition and/or misprision of treason (in time of war) by the appropriate element of the U.S. Department of Justice. *Anyone wishing to acquire a personal Arab-to-English verbatim translation of Islam’s said declaration of war on the United States, which in 2004 was seized by Special Agents of the FBI in compliance with a federal search warrant from a subterranean basement in Annandale, Virginia, may do so (for a nominal handling & postage fee) by contacting http://www.securefreedom.org to request: GOVERNMENT EXHIBIT 003-0085 3:04-CR-240-G U.S. v. HLF, et al.